Old Rittenhouse Inn’s Landmark Restaurant is serving a delicious 3-course Mother’s Day Brunch on Sunday, May 8. Landmark is well known for it’s elaborate multi-course meals, and brunch is no exception! The first course includes a choice of Creamy Swiss Onion Soup, Baby Spinach Salad with Bacon Dressing, or Sherry-poached Winter Fruits, along with fresh bakery and house-made preserves. Champagne Chicken with Roasted Mushrooms. Your server will describe the Mother’s Day desserts, which include the classic Turtle Sundae, French Silk Pie, Vanilla Pot du Creme with an Almond Florentine Cookie, and Bumbleberry Sorbet with fresh Berries. Cost is $24.50/person plus tax and gratuity. Seatings from 10am to 2pm. Space is limited! Please call 715-779-5111 to reserve Brunch at Old Rittenhouse Inn’s Landmark Restaurant. Get ready for our Red Wine Weekend taking place April 8-9, 2016. 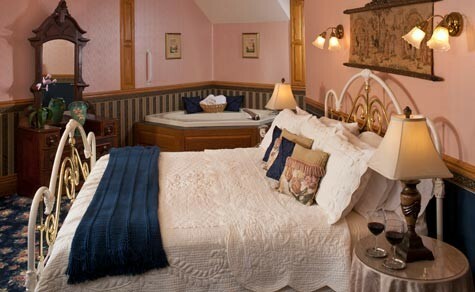 Enjoy fine wines, delicious food, and exceptional lodging in Bayfield, WI. Events are held at Le Chateau, a sister property of Old Rittenhouse Inn, and the historic Landmark Restaurant at Old Rittenhouse Inn. The highlight of the weekend events is a 6-course dinner with wines specially selected to match each dish. Dinner Includes 6 courses and 5 wines. $75/person plus tax and gratuity. For discount weekend lodging packages, Call 715-779-5111 or Book Online to reserve a place at the table. Old Rittenhouse Inn’s Landmark Restaurant is pleased to announce the menu for our 40th annual New Year’s Eve Dinner. This special event consists of six courses: Appetizer, Soup, Salad, Sorbet, Entrée and Dessert. The fixed price of $75/person plus tax and gratuity includes a complimentary glass of champagne. Beggars Purse with chevre feta frsh spinach and basil wrapped in puff pastry. Black Bean Soup with Quinoa. Mixed Greens with Blueberry-Port Vinaigrette+Shaved White Chocolate+Figs+Craisins.